I’ll bet you guessed, when I hinted earlier this week about a giveaway. Didn’t you? Well, you were right! I just can’t help throwing a little special giveaway in honor of my new and first ever product offering. This is NOT a download. You’ll be winning an actual completed file folder game that you can pull out of the envelope, cut the cards apart (it’ll take you just a few moments, I promise!) and put it in a work box. Hows that for super simple? What do you have to do to enter? Any of the following list will do nicely, as long as you do it before April 30th! Write a comment at this post letting me know what math or language topic you are or will soon be working on with your child(ren). I’m always hungry for game ideas! Don’t want to wait for the giveaway to end? While this giveaway is going on (that means until April 30th) I’m lowering the price of this file folder game to $4.50, so go ahead and snag one! Don’t worry. If you end up winning the contest after purchasing one, I’ll refund your purchase price! And one last thing: Thanks for enjoying my site! I love to share these things with you. I am 13 but I still read your blog for inspiration about what math games to make for my brother. He is learning his 2 and 3 skip count tables(times tables) and learning in reading -ing words, and learning to describe what he is doing. Thanks for hosting the giveaway! I would love to win, but I will be buying it even if I don’t! My son is just starting to read, so we are working on the whole “silent e” thing and continuing with word families. 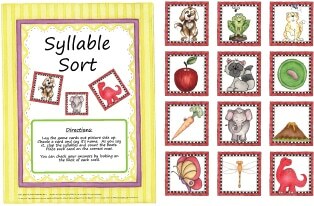 We have also done some syllable & rhyme sorts,which we thinks are fun! This would be a great thing to add to our workbox rotation! Hi, I am working on math multiples with my 2nd grader and trying to teach him his 2’s multiplication. If you can come up with some games for that, I would LOVE LOVE it!! thanks for the giveaways, they are great! Hi, thanks for the giveaway! We’re working on beginner reading skills (mostly CVC words and practice reading from Level 1 books). In math, we’re working on addition of numbers 0-10.